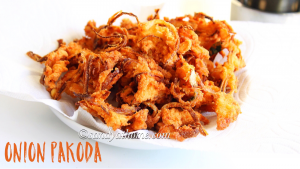 Onion pakoda/ Onion pakora is one such most sorted snacks just like bajji during rainy season or cold weather. 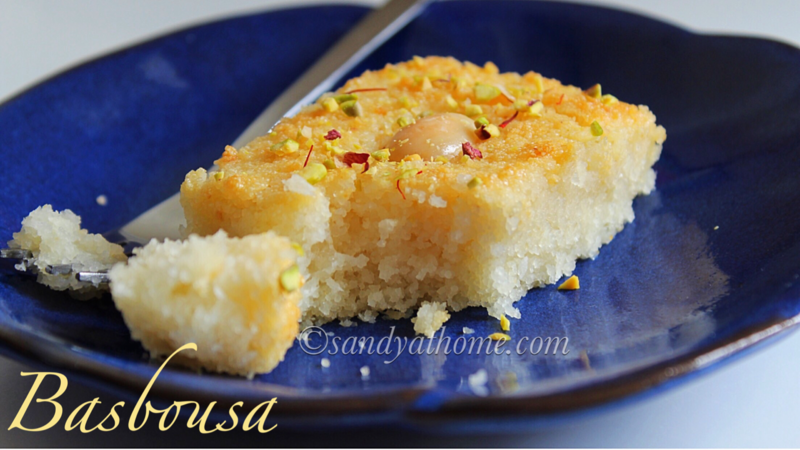 Since the temperatures have started to drop snacks like these when accompanied with a cup of hot chai/ coffee can make snack time a pleasant ones. 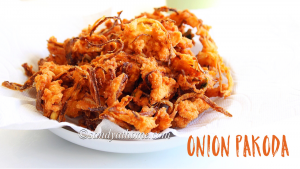 Onion pakoras don’t need much of ingredients in its making and also does not demand much time to prepare hence make a continues to be quick and easy snacks. 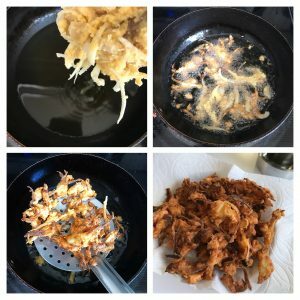 We all have craved for the store bought look alike pakoras at home but often fail to get it right because of the batter. 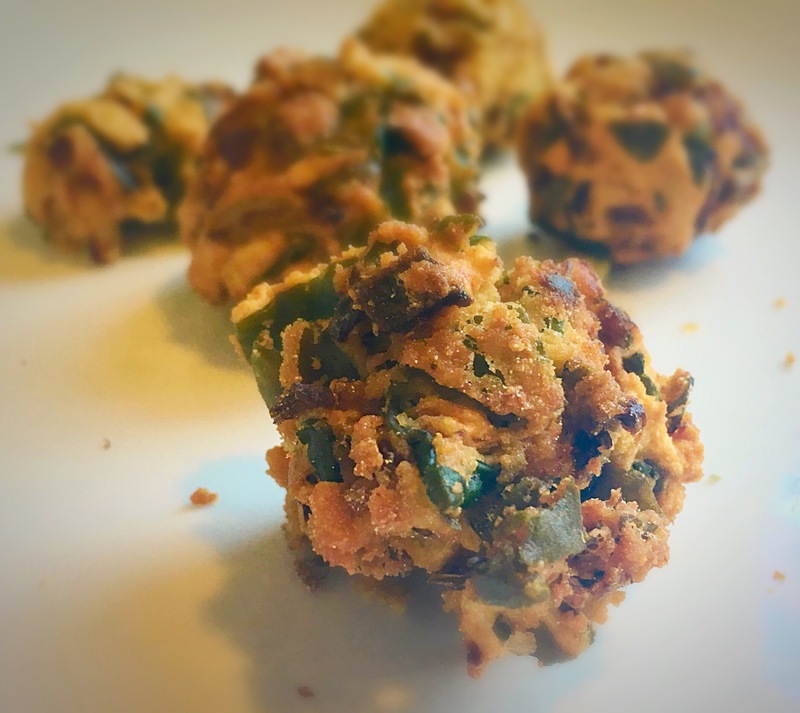 Yes the batter prepared for this fritter needs to be a crumbly one which requires very little addition of water so you need to add water gradually and cautiously. Once you get it right then the next time you are gonna be master at this. 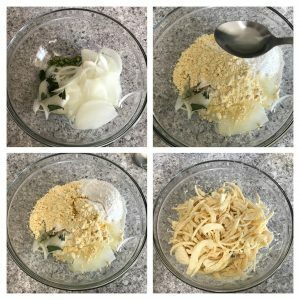 So I am here sharing recipe that works best for my family, try it and let me know your feedback as well. So lets get to the making! Heat oil in a frying pan. 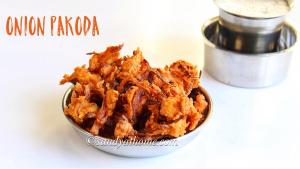 In a bowl add thinly sliced onions, besan flour, rice flour, chopped green chilli, curry leaves, salt and hot oil. Mix well. Now add water gradually to form the onion pakoda batter. The batter should be crumbly. (I used less than 1/3 cup water to make crumbly batter). Now spread the crumbly batter in oil using fingers. Does not require any particular shape. Fry them in medium flame flame until crunchy and light golden color. 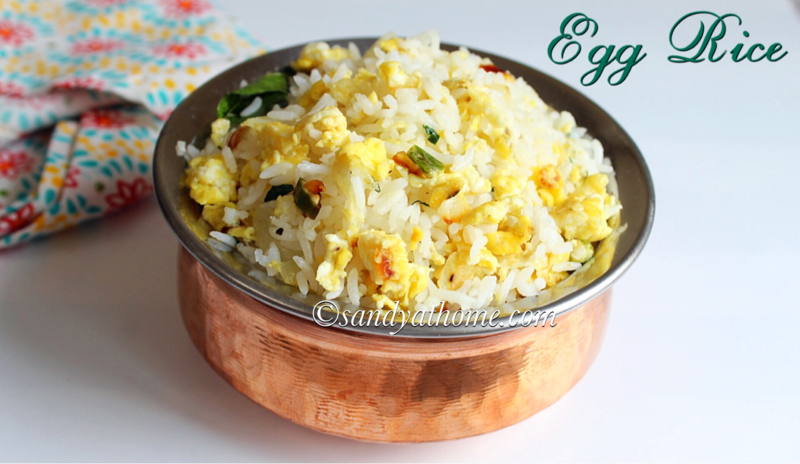 When done remove it using slotted spoon and transfer it to a paper towel and serve it hot with chai/ tea! Repeat the process till all the crumbly batter is over! Heat oil in a frying pan. In a bowl add thinly sliced onions, besan flour, rice flour, chopped green chilli, curry leaves, salt and hot oil.